Internet Modeler Academy 1/35 T-34/76 "Factory 183"
Academy 1/35 T-34/76 "Factory 183"
If there was to be only one iconic Soviet tank of the Second World War, it surely must be the T-34. The T-34 was manufactured from the start to the finish of the war, built in larger numbers than any other WW2 Russian tank and in two main variants: the initial T-34/76 with a 76mm main gun, and then the T-34/85 with an 85mm main gun. It proved a real shock to the German troops in the opening weeks of Operation Barbarossa in 1941, as it's sloped armor made it very difficult for German gunners to combat. 1 booklet, with 6 pages of black and white assembly instructions covering 15 assembly steps and incorporating a sprue map. A separate double-sided painting and decaling sheet is also included. There is NO shortage of 1/35th scale T-34/76 kits! Tamiya's T-34/76 Model 1942 was the first I saw, way back in 1975. Zvezda and Italeri released various versions of the T-34 in the 1990s, before Dragon Models let loose with an avalanche of kits, starting in the early 2000s. In 2009 AFV Club released a half-dozen kits, with "full interior detail," while ICM joined the bandwagon in 2015 with two kits. Academy first joined the T-34 party in 2015, but they initiated their line with the later version of the series, the T-34/85. However, they have now issued their own T-34/76, a "No. 183 Factory Production" model. When I first received this review kit, I thought Academy must have included lead bars in the box, as it was HEAVY. There certainly isn't a shortage of plastic bits, in that Academy gives the modeler a number of optional parts in this kit. There are, for example, THREE full sets of road wheels. There are two options for the external hull fuel tanks. The thickness of the parts is also substantial in such areas as the main hull parts, and turret shell parts. This in no way detracts from the kit parts, but helps explain why they are so "heavy". The kit lists itself on the box top as a "No. 183 Factory Production" variant, and appears to be from the time period of mid-1942 to early 1943, based on the parts. Over the course of the T-34/76's production life vehicles were produced at no less than 7 different factories, and these vehicles received sub components from numerous other factories. This thereby allows the modeler to produce a number of "different" looking T-34/76s. In fact, within Academy's kit box, there are parts for not only a 183 Factory vehicle, but also a 112 Factory tank. 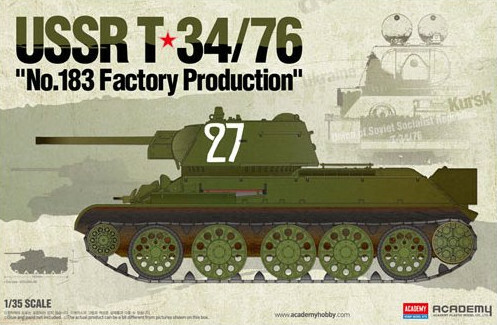 This hints to the strong possibility that Academy will release a "Factory 112" kit at a later date, as they did with their T-34/85 range. The tracks in the kit are link and length injection plastic, which I think is far superior to so called "rubber band" tracks, especially for T-34s, which did have track sag. Individual links wrap around the drive and idler wheels, while longer lengths form the upper and lower mid sections. Detail is a bit soft, and there are visible ejection pin marks on the inner faces of the tracks that will need removing. The tracks represent the 500mm "waffle" pattern variety. There are three full sets of road wheels-two different sets of steel rubber rimmed ones, and one set of all steel wheels. Rubber was in short supply starting in early 1942, due to the Japanese invasion of the southeast Asian rubber producing regions. The Russians consequently went with all steel road wheels on the T-34 in order to save on rubber. Rubber rimmed road wheels were reintroduced at least for the first and fifth road wheel positions, because vibration from the steel road wheels were murder on Russian tank crews. The Russians returned to rubber rimmed wheels for all five road wheel positions on the T-34, as rubber supplies improved. Anyway, the detail on the Academy supplied road wheels is excellent, and the modeler receives lots of surplus wheels for the spares box! I recommend that one thoroughly reviews the instructions prior to launching into the construction of the hull and turret of this kit. Academy provide 5 different marking options for the model, and different alternative parts are required for the various marking options. Lots of holes need to be drilled, to accommodate the various options, as well as the modeler keeping track of which optional parts go with which marking option. Construction starts with the assembly of the lower hull components, where I am happy to report that there are no "working" components. I know that being able to position the running gear at different angles is great for those wishing to build dioramas, but for the vast majority of modelers all "working" signifies is more complexity, and more chance to misalign things. On this kit, there is only one way to install the road wheel arms, and they are solidly in place once glue is applied. The kit is also minus any interior detail. Again, this suits me just fine, as having just completed a build of another firm's kit "with full interior", it came with 1200 parts. I was happy to see Academy's T-34/76 completely devoid of any interior parts bar those required for structural integrity. Academy gives the modeler alternative lower and upper hull rear plates, so care is needed to make sure the correct ones are chosen for the marking option the builder picks. Also on the rear hull, Academy provides the modeler with positionable air intake cooling flaps. The modeler then chooses either a solid hinged cover to place over this area, or a multi part one with photo etched mesh. Note that the PE mesh parts are manufactured from a nickel/steel material which does not bend as well as brass. For whatever reason it also didn't seem to glue as well as brass when it came to using CA glue? Academy once again provides alternative fuel cell parts, either the box shaped fuel containers for the rear of the hull, or drum shaped containers for the hull sides and rear. The grab handles on the ends of each drum shaped container are molded solidly. I think this is a pity since Academy, having already provided PE parts for the mesh components could have easily, and surely inexpensively, provided photo etch handles? However, these handles can easily be fashioned from some lead foil strips, if desired. Various alternative hand rails are positioned on the upper hull, and I felt these were a little clunky, in terms of scale thickness, but perfectly usable. At the front of the hull, Academy provides the option of either a glacis plate machine gun or flame thrower unit (to build a so-called OT-34/76). The main turret shell part in Academy's kit (part E15) is for a so called "hexagonal" shaped variant. These turrets were cast, with a rolled steel roof plate welded on top. The kit comes with alternative layouts for the turret roof: either two small "mickey mouse ear" hatches, or one of these small hatches together with a larger cupola style hatch system. I felt that the "cast metal" effect provided by Academy on part E15 was excessive and too uniform in its appearance. So, I would advise the modeler to get a few good photos of such turrets, and alter the surface to get a more realistic looking effect. As for the turret interior, there is no interior detail. Not even the most rudimentary gun breach, etc. This suits me just fine! The gun barrel is a one-piece unit, which with careful sanding of the mold seam lines is perfectly acceptable. The decals appear well printed, and have good color saturation. Options 1 through 3 are vehicles with mixed rubber and all steel wheels, with the square rear hull fuel tanks, and are listed as being operational in mid to late 1943. Options 4 & 5 are OT-34/76 flame thrower tanks, one of which was apparently dragged out of a swamp in 2006! These two have all-rubber rimmed wheels, and drum fuel tanks. Like the real tank itself, Academy has provided the modeler with a solidly designed model kit of the T-34/76. There are plenty of alternative parts, yet the overall parts count is not excessively high for any given decal option choice. The quality of the parts is very good overall, there being no flash on the parts, nor sink marks. There are ejection pin marks that will need removing on the tracks though. Price wise, the Academy kit offers good value for money compared to the T-34/76 kits offered by other manufacturers, especially considering the large number of "options" contained within the Academy boxing. My sincere thanks to Academy's US importer, MRC, for providing Internet Modeler with the opportunity to review this kit.